Manufacturer & Exporter of Cupola Tent. 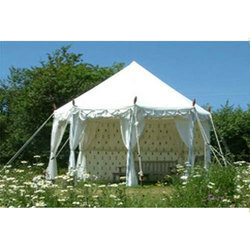 Our product range also comprises of Maharaja Tent, Outdoor Tent. Backed by years of industry experience, we are engaged in manufacturing, supplying and exporting good quality Cupola Tent. These products are manufactured from premium quality raw materials, incorporating latest technology. Offered products are widely appreciated for their durability, eye catching designs, and optimum tensile strength. Our tents are highly resistant to moisture and heat as well.